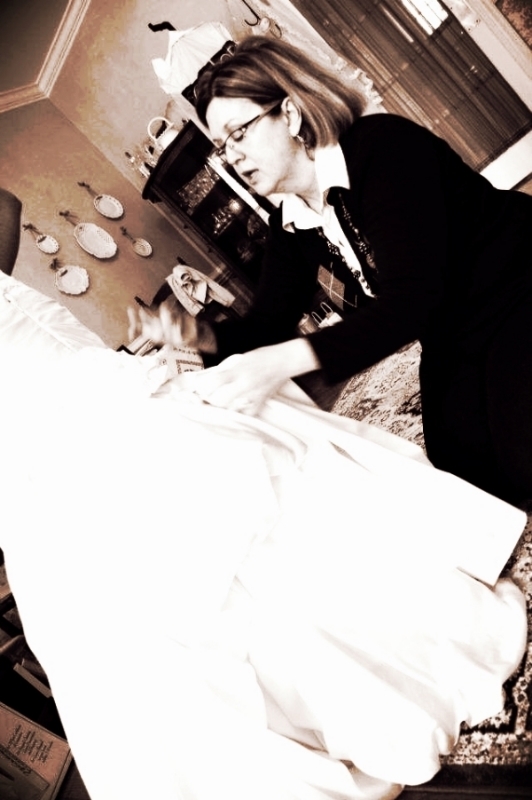 Formerly located in San Diego, Chicago and Dallas, Renée Lundin is a Degreed designer and Master Seamstress, with over 30 years experience. Renée began her career as the alterations department manager of I. Magnin and Marshall Fields in Chicago and Bullock's of California. She now uses that experience in her home studio to give each customer the one on one services that they deserve. Her years of experience and love for her work shows in what she does everyday. Giving personal, one on one attention, and expert service to each of her customers is her passion. Renée has traveled to New York City and has had the privilege to work on gowns from Kleinfeld’s - the well known bridal gallery from Say Yes to the Dress, on TLC. The highlight of her visit was meeting the staff including Randy Fenoli the Director of Fashion. She has worked with a variety of clients including Miss America 2006, engaged members of the Dallas Cowboys Cheerleaders, and the fitting and tailoring of formal attire for prominent area dignitaries and debutantes. Renée is a member of the Association of Sewing and Design Professionals, American Sewing Guild, Association of Wedding Gown Specialists, Project PINK, and Brides Against Breast Cancer.